THE BLEACHER BRIEFINGS: The Most Controversial Player Ever? The Most Controversial Player Ever? You'd be very hard pressed to find a sports fan who is indifferent about Tim Tebow. He is the 2010 1st round selection by the Denver Broncos that's not the typical drop back quarterback, doesn't have the typical quarterback throwing motion and talks openly about his faith. He was also a Heisman-winning, 2-time National Champion in college. Mention Tebow's name though and you're sure to get a fury of responses, both positive and negative. Those who support Tebow stand firm, refusing to accept that he completes less than 50% of his pass attempts. Those who can't stand him refuse to see that he's thrown 9 career touchdowns against 4 interceptions while rushing for nearly 400 yards and 7 scores. However, he's not in the top 30 passers or the top 30 rushers in the NFL this season. His supporters are happy today following a Broncos win against the division rival Oakland Raiders. Tebow completed 10 of 21 passes for 124 yards and 2 touchdowns while rushing 12 times for 117 yards. His Broncos are now only a game back in the division, having won 2 of their last 3 games. The team is also 30th in passing, while maintaining the 8th best rushing attack. No doubt Tim's a quality guy, but that doesn't change the mind of any haters. However, supporters would claim being a good guy makes him a role model, someone kids can look up to. Is he an NFL-worthy quarterback? You guys tell me. Tebow has what people like to call the "it" factor as a quarterback. He may not always look pretty doing it, but the guy is a winner. His teammates respect him and they play hard for him. That's all that matters. As far as raw skill goes, Tebow isn't an NFL quarterback. However, if you also factor in his heart and determination, he is worthy of playing in the NFL. He has the ability to make other people around him play harder, which is rare. I personally pull for him because I like him as a person. Close with this, but no cigar. I think the most controversial player of all-time is Michael Vick. Cross out Vick's past, and replace him with Terrell Owens. 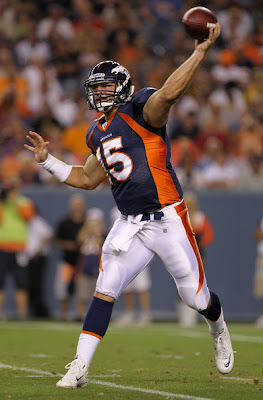 To me, Tebow is a left-handed, white version of Vince Young. The guy wins, but it's hard to pinpoint exactly HOW he does it. And like Vince, I think a career as someone's backup is in the not so distant future for Timmy. He's just not an accurate passer, and that's a GIANT PROBLEM to have as a quarterback. I suppose it's something he could improve on, but I don't think it'll happen. People love him as a person, and at this point, people in Denver just want someone, ANYONE, to believe in. In the end, I just don't see Tebow being the answer. He's a trendsetter. I'm "Tebowing" as we speak. Troy - Perhaps I should retitle this "The Most Controversial On-Field Player Ever". I don't think Vick's time on the field would ever be deemed controversial at all. The guy has always been a performer, made Pro Bowls (something Tebow won't be doing at his current rate) and is currently 8th in the league in completion percentage. Same goes for T.O. - arguably one of the top 5 receivers EVER. Tebow though, he probably doesn't deserve to be on the field. If you're not completing 50% of your passes and your team is 3-5 in perhaps the worst division in the league, do you deserve to keep your starting gig? If this is any other player, not a chance in hell. Tebow has very little NFL skill, but the man's will is off the charts. That counts for something. Tebow is a WINNER. He showed it in college, and he's showing he can win in the NFL. Isn't that enough?!? !